The Xavier Society for the Blind has empowered Sharlene Kraft with tools to expand her service to the Church. Now she sits on the society’s newly formed advisory group. As a legally blind child, Kraft said it was difficult for her to feel engaged in the Mass. She could not understand the Latin. She could not see what was happening at the altar. She could not see the art that inspired others to contemplation. Her present experience is quite different. Not only can she understand the words spoken at Mass, but she can now walk up to the altar, then to the lectern and read the Word of God for the benefit of her fellow congregants at Holy Family, Flushing. There were hurdles to overcome before Kraft could become a lector. First she needed to have access to the readings. That’s where the Xavier Society stepped in and provided her with a Braille lectern which she can use to practice and during Mass. She also needed to know where to go without being able to see the altar. So the head of the parish liturgical ministry practiced walking up to the front of the church with her. Someone from the church also calls her when it is her turn to read so she can practice the Braille in advance. The Xavier Society has helped Kraft on a more personal level as well. When she wanted to pray the Stations of the Cross, she called the society for help. They translated Stations into Braille for her. 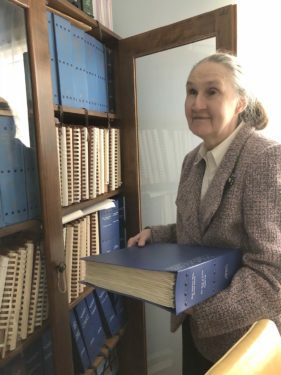 The Xavier Society, a Catholic organization based out of Manhattan, provides spiritual and religious material in Braille, large print and audio to the blind free of charge. According to its executive director, Malachy Fallon, the society has organized an advisory group to help select new content for transcription, advise on the best use of technology and provide guidance on new initiatives. Kraft is uniquely qualified to sit on this board: she graduated from Columbia Law school, worked for government agencies in Chicago and New York investigating claims of illegal discrimination. She’s a board member with the Paratransit Advisory Committee for the Metropolitan Transportation Authority on VISIONS/Service for the Blind and the Visually Impaired Queens Advisory Board. Kraft even moderates the book discussion group at the Andrew Heiskell Braille and Talking Library. Aside from her professional background, she knows what it is to navigate life, travel, work, leisure, finances, spirituality and womanhood without the benefit of normal sight. Kraft has been legally blind her whole life. As a child in Chicago she could see and write very large letters, but that went away in high school. She had to be transferred to a Braille-based education. Throughout her life she could see light and shadows and occasionally red, but what little use of her sight she had is now going away with age. Kraft is not one to feel sorry for herself or find fault with God’s plan for her life. She is grateful to God for the gifts He bestowed upon her and lives life with a sense of appreciation and wonder. When she became an adult, she decided to take advantage of her new found freedom and take an independent vacation to Boston. Seeking aid in her quest, she called the American Foundation of the Blind. This being before the age of the internet, she called to gain some practical knowledge. Her first job was in Galesburg, Ill., as a medical transcriber. When she moved into her first apartment, she decided to go down the boulevard near where she was staying and ask all the businesses what their trade was. She went from door to door telling those she found inside that, if they told her what kind of business they were running, she would make a note of it on her map and if they told her what they were selling she may buy from them. In the ’80s, she decided to follow her dream and move to New York. She found employment with the NYC Commission on Human Rights investigating claims of discrimination based on legal protections. Her boss encouraged her to pursue a law degree. She was not particularly passionate about this idea, but decided to give it a try. She applied only to the nation’s top law schools. If she did not get it, that would be that. Columbia accepted her. As she was preparing to begin her studies, she attended a conference with the National Association of the Blind. It was during one of the smaller conferences, one that focused on legal work, that she asked the room if there was anyone there who went to Columbia. A young lawyer named Bob, who was also blind, said he did and gave her his phone number. Kraft remembers being really nervous. She asked her friend to sit next to her as she got ready to call him. She had never been the one to call a man to meet for coffee before. The conversation went well. The meeting went well. And before Kraft even had the chance to start classes, he had asked for her hand in marriage. Kraft was reluctant at first. She was afraid the arrangement would not be fair to Bob. She was about to start law school – did he really want to have to deal with all that again? Plus, her mother was starting to get sicker and would need more care. But Bob loved her and was not a going to be scared off by life’s difficulties. From that day on, they tackled them together. After she earned her degree, the young couple planned to move to Kraft’s home state of Illinois. She was admitted to the Illinois State Bar. But this was not meant to be. The couple ended up staying in New York. Kraft did not pursue the New York Bar, for among other reasons, she was now taking care of her mother, who had moved in with them. The couple agreed that Bob would be the one to sustain them financially. They welcomed Kraft’s mother to their home and kept her in mind when they went on to buy a new home in Flushing. They even built a ramp for her. She died just before the family could move into their new home. However, the ramp became an essential part of the household nonetheless. Kraft’s brother Alan, suffered a stroke, and although he went to a nursing home, the couple did not feel he was getting the proper care so they brought him to live with them. He cannot walk and needs constant care. In her adult life, Kraft had fallen away from the Catholic Church. She thought that it often spoke more of helping those on the fringes than actually doing something about it. When the couple moved to their home in Flushing, just two blocks away from Holy Family Catholic Church, Kraft decided to give it a try. Little by little, she became more involved in the parish. One of the priests showed her deep kindness, even bringing her up to the altar so that she may feel what had been a mystery to her. More than that, he showed concern not just for her needs as a visually impaired adult, but as a person. The choirmaster continues to call her and lets her know which songs will be part of the following weekend’s Mass so that she can pull them up from her Braille catalogue and participate more fully as a member of the congregation. She began serving as lector and greeter and has deepened her ties with the Xavier Society. It’s not always easy for her to get to Holy Family for Sunday Mass. There are no lights at the crosswalk and lots of traffic, making crossing difficult for those with vision impairment. Bicyclists and weather add to the danger. She remember going out one day after a storm and a street sign falling right in front of her. She took that as God’s sign to go home. But Kraft does not live in fear. She also knows that God only requires for her to give it a good faith effort and if she can’t make it for reasons beyond her control, He won’t blame her. She does not blame Him for her blindness. “I think God treated me rather gently,” she said. For more information on the Xavier Society visit http://www.xaviersocietyfortheblind.org/. I love it ! I had the honor to meet both Sharlene and Bob this year in the Arise Group and they are really inspirational. She participates anywhere she chooses and in the Arise meeting used her Braille Bible and Recorder to take down any info or contact info too ! I make sure I stop by her phew Sunday’s to say Hi to both and I am so glad someone sent me this article, She truly is Blessed and Motivational. Beautiful article about a wonderful organization and an inspiring lady! Thank you.